The Bulk Backlink Analysis (formerly known as the Quick Batch) report is a simple and effective tool to use when prospecting link building opportunities. Enter up to 200 URLs (one per line) into the box at the top of the report and the table will populate with data about how many backlinks and referring domains point to each URL. Comparing your backlink profile to competitors is an important part of your competitive analysis because it can highlight the link building opportunities in your direct niche and give you an idea of how far ahead or behind of your competition you are. 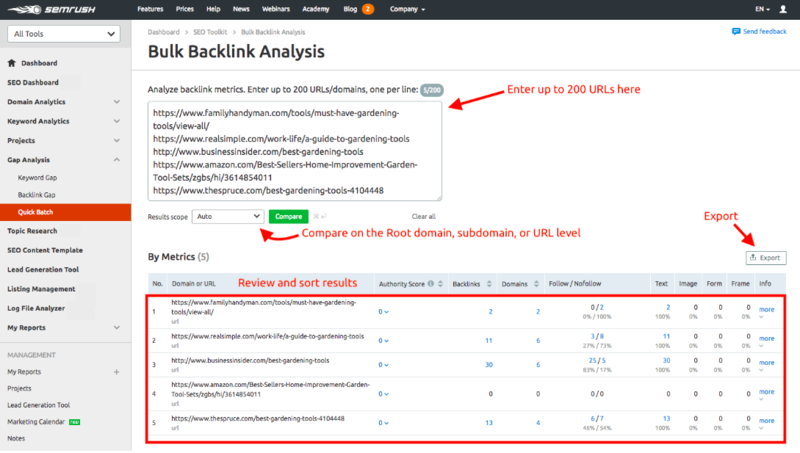 Why use this report instead of the Backlink Gap tool? While the Backlink Gap tool works for comparing the scope of 6 domains, this report helps you look at a wide scope of up to 200 URLs from various websites. If you want to compare similar types of content across more than 6 domains, you can do that here. For example, let’s say your website sells baseball hats and you want to publish a baseball hat buying guide and use it to attract backlinks in your market. You could scour the Internet to find dozens of different sports accessory buying guides and throw the URLs of the other guides into a Quick Batch tab. Then, you could enter their URLs here to get a report of which buying guides on the web acquired the most backlinks and referring domains. In order to see the number of referring IPs and TLD backlinks, you will have to expand the “info” column. For an easy way to get a big list of link building prospects, be sure to try out the Link Building Tool .